Chiropractors who have been in practice long enough quickly learn that the medical profession is doing nothing to endear itself to the aching public. The medical-model approach (looking for pathology) makes little sense to the lay public. The costly approach to solving the riddle of back pain (symptomatic relief) with many worthless tests just never feels quite right to any segment of the population. Ask employers how they like the current system, after paying such high workers’ compensation premiums for an aging, overweight, and out-of-shape workforce. The sad fact is that no one in the medical community is looking at the patient from a biomechanical perspective. Human beings are architectural structures, yet it is virtually impossible for a person in our country to go into a medical office and ask his or her “specialist” for a personalized structural status report. Mechanics can tell you the status of any car you bring to them, and an engineer can quantify the value of a building or bridge. But try to find a doctor who can give a report on someone's structure, and you will probably have better luck finding a winning lottery ticket that’s been accidentally thrown away. Any human being who is seeking long-term wellness for their structure would do well to locate and work with a professional who can help them preserve their structure. “Preservation of the human structure” is a term not often heard in our current system, but it needs to be heard in an effort to reduce the amount of money currently spent on musculoskeletal breakdown, injuries, and symptoms in this country. The first test done on a patient should be a check of the patient’s foot type. It is well-established that there are three different foot types (low arch, medium arch, and high arch), and the running shoe industry has even gone so far as to make specific shoes for specific foot types. So wouldn’t it make sense for doctors to alert the patient as to their foot type? With a low arch/flat foot (or flat feet), a motion-control shoe is recommended. This is the foot type of 70%–80% of the population. Those with a normal, medium arch (about 10% of the population) would benefit from a stability shoe. A high medial arch, or a supinated foot, constitutes about 10% of the population, and it works best with a cushioned shoe, as a supinated foot typically will be rigid and more sensitive. Two basic tests are performed when checking body-weight distribution and foot type. The first is to manually check standing arch height by getting down on your knee and inserting your middle and index fingers under the patient’s medial arch. See Figure 1, a DC prepares a patient for a digital foot scan, which will yield digital images of the feet, as Figure 2 illustrates. The second method for checking foot types and identifying weight-distribution imbalances is with a digital scan of the feet. With proper software, you will see the difference in the patient's weight, right versus left, and front versus back, and this visualization for the patient is extremely important when motivating the patient to take action. As you can see in Figures 1 and 2, digital scanning provides a wonderful visual. The next test of concern is the Q angle of each knee. An increased Q angle is nothing more than a crooked hinge joint. The greater the imbalance, the greater the wear and tear on the knee. If neglected, over time, the likelihood for a knee replacement increases greatly. Range of motion, muscle-tension tests, deep tendon reflexes, leg-length measurements, and spinal-compression tests are all part of biomechanical testing. In addition, and most importantly, standing biomechanical x-rays are taken on all patients, to rule out pathology and look for biomechanical findings. Figure 4 shows a center of gravity check using lateral x-rays. 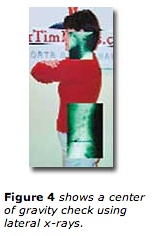 Figure 3 shows a center of gravity check using anteroposterior x-rays.. There are multiple biomechanical findings that we look for on x-rays. 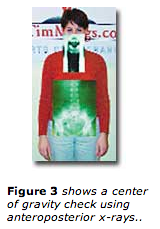 First of all, we check centers of gravity, both anteroposterior, as Figure 3 illustrates, and lateral in the neck and lower back, as Figure 4 illustrates. Second, we check for positional abnormalities, such as reversal of the normal cervical lordotic curve, rotation of the pelvis as seen on the anteroposterior lumbosacral, or rotation of the axis in relation to the atlas. When biomechanical imbalances and joint dysfunction occur for a prolonged period of time, the degenerative process accelerates. Trauma, repetitive motion, structural imbalances, and joint fixations lead to an acceleration of joint degeneration. When degenerative changes are found on the x-ray, the practitioner should determine the history behind the degenerative change. For example, when C5 alone is going through degenerative changes, it is clearly a fixation due to abnormal stresses at that level. When a joint other than C5 or L5 undergoes degenerative changes prior to C5 or L5, it is due to prior traumas that have been unresolved. A joint left “locked” or subluxated for an extended period of time will produce a premature degeneration of that joint space. No profession is out there selling “preservation” of the human frame. Yet, think of the savings in the health care field if we can help preserve everyone’s neuro-musculoskeletal system. And, this savings is based upon individuals proactively doing what they need to do to preserve their structure. The first step in helping anyone to preserve their structure is to recommend custom-made orthotics. In my office, since we do Structural Management® exclusively, 95% of our patients are fitted for such orthotics at the beginning of their programs. Regardless of whether they are covered by insurance or not, patients understand the role custom-made orthotics play in their future. There are different reasons why these supports are recommended, and there are different types of custom-made orthotics that we need to understand. First of all, any structural imbalances, centers-of-gravity imbalances, rotations, or dysfunction of joints need to begin correction with the fitting of custom-made orthotics. Un-less that medial arch is addressed so that it is bilaterally even, there will be an ongoing imbalance in the structure. As the aging process continues, premature degenerative changes will occur. 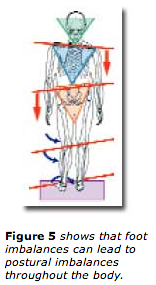 Figure 5 shows that foot imbalances can lead to postural imbalances throughout the body. If the patient pronates, it becomes obvious why custom-made orthotics are needed, especially if right and left are different. The “crooked man” image (Figure 5) clearly shows why imbalances in the medial arches of the feet have exponential implications in the structure above. In this case, the left foot pronates, leading to compensation in the knee, hips, and shoulders. This imbalance will clearly lead to other imbalances and premature wear and tear of joints. This obviously sets the patient up for an increased vulnerability to injury. When the patient presents with degenerative changes in any joints, the need for custom orthotics increases, as there is clear evidence that a certain joint has been under an increased level of stress for a prolonged period of time, and the outcome is premature degeneration. A rigid orthotic is designed for an imbalanced foot; however, it offers no shock absorption for the entire structure. These orthotics last an eternity, but their restriction of normal foot mobility, their overcompensation of joints and muscles above, and their absence of shock-absorbing qualities make flexible, weight-bearing orthotics preferable. I use a digital scanning system, which educates the public that symptoms are not the issue; it’s biomechanical imbalances. In industry and sports—in most issues of postural health, for that matter— biomechanics is the key. The chiropractor is best suited to respond to these needs, but the chiropractor must be willing to “step up” outside the normal insurance guidelines to provide such help. In time, chiropractors will realize the benefits of this type of work.